perfect our recipe before the full onslaught of fruiting. into more than five pickles at once. the cukes. Stand the jar up and sprinkle in the spices and vinegar. add just enough boiled water until they float. of the top of the jar. We then covered the funnel with a small plate. they become overpowering and excessively darken the pickles. 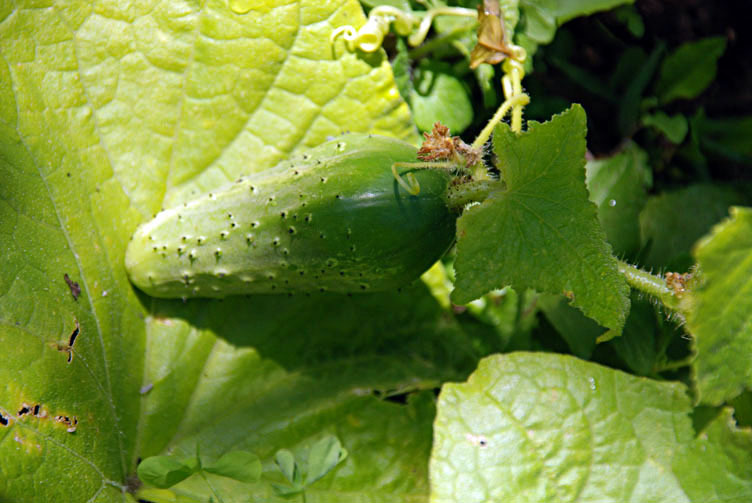 I’ve searched and searched for a recipe to use …Most sound too complicated for a busy mom to bother with, so my cukes either get eaten fresh or handed out to assorted neighbors and friends. If this works ( and I’m excited to try it! ), you’ll have my gratitude and I’ll finally have some fresh pickles!!! I’ll let you know how it goes!Thanks. Amanda, We find this a really simple recipe, and used it for smaller or larger batches all summer (NZ summer- we are in the dead cold middle of winter now). I hope it works for you- do let us know! I made three batches of these pickles. I tasted the brine and was happy about the flavor. I will let them set for about a month and then try them. I will check back then but I think me and my family are going to love them. It was very simple and easy for small batches. Sandy, we can’t wait to hear how they turned out. You would be surprised how good they taste after just a week or two! It’s nice to see a recipe that can be used for small batches. One question though, when making the brine, should the garlic be peeled before added or just placed in as a whole clove? Alexander- that’s peeled garlic. Thanks for asking and we hope you enjoy! OK, LA Kings fans, that was certainly not a use we had imagined for this recipe, but you have us intrigued if somewhat perplexed. Let us know how they turn out! I made this recipe 2 days ago (altering the spices to what I had on hand) but I don’t see bubbles…I don’t know what the bubbles indicate. Please advise. Kim, these are fermented pickles, so bubbles come from the fermentation process which adds sourness like in sourdough. If they are in a very cool place you might not see the bubbles, it’s just occurring very slowly and you might have to wait a little longer for good flavor. The vinegar adds sourness anyway, so they just get a more complex flavor from fermenting. My daughter and I make these almost weekly so we constantly have a jar on hand. We are THRILLED to be able to have fresh pickles on hand all the time. I am so thrilled to have found your reciepe. I have had several years of serious illnesses and am so glad to be gardening again( with the help of my grandsons). I have picked the first of my cucumbers but didn’t want to wait on the big batch of pickles I used to make. I was soooo thrilled to see, make and eat my first pickles in 4 years. Thank you. I found your excellent recipe. I altered it somewhat to match my tastes, but the process was very helpful. I have just a couple questions… Does it matter if I use plastic containers rather then glass? Will they still ferment if they are kept in the fridge the entire time? Please advise. I am very excited for my first batch to be finished. We haven’t tried plastic or straight into the fridge, but both should work. There’s a slight risk of the vinegar leaching a plasticky flavor into the pickles so we choose glass, but lots of companies sell pickles in plastic. And they do ferment in the fridge, just much slower. Can’t wait to hear how they come out! can the pickles be quartered instead of leaving them whole? Also, do you leave them undcovered while fermenting, or should I cover them with a plate? Crazyxu85, we have never tried quartering them, but imagine it would work fine. We have never had trouble with the trimmed ends so cutting shouldn’t hurt. We definitely cover them. Quartering pickles is fine, I do it all the time for the “big” ones as you can stuff the jars more. I do a “hot Brine” type and get around 90-95% sealing on the first time. No biggy though as the ones that dont seal go into the downstairs fridge and are used first. This year we made 60lbs! WoooHooo Cant wait! 4 days and counting. Can I cover these with the jar lid while they are brining or should I cover it with a plate so air can still get in? You can use a jar lid – but there is a risk of pressure building up if they ferment, so it is best to keep it loose, and check it periodically to make sure it is venting. thanks for this recipe for a small quantity of pickles. I just started a small jar today with your recipe. First time I ever pickled pickles. Can you please tell me, are the pickles to be left out of the refrigerator for 4-5 days before putting them in the fridge? Craig, sorry we didn’t see this sooner- hope they worked out! We leave them out, but you can put them in the fridge, it just takes longer for them to ferment. i was wondering.. how long will these pickles keep in the pantry? would it be ok to use the sealing lids on the jars? dponder, we have strictly used this as a refrigerator recipe, and to be honest a jar doesn’t last long around here :). So we haven’t tried putting them in the pantry or using sealing lids. Sorry we can’t be more helpful! Finally found your recipe, after quite a long search! (Just way too many out there) I am excited to see how this turns out. I see many responses in the positive. Just one question, do you add liquid? I noticed that I lost a bit of liquid, since I filled the jars. Mark, We are glad you found us! We didn’t lose much liquid over the week or two before we refrigerated them. If the pickles aren’t staying covered, I would add more brine, otherwise it shouldn’t matter too much. Hope they are tasty! I used your recipe and tripled it because I had enough cucumbers to make 3 jars. I didn’t have garlic cloves so I used garlic powder instead. Doesn’t look as “pretty” because it doesn’t dissolve well in the vinegar but I’m hoping the taste will be the same. My question is: is there anything wrong if I didn’t see bubbles? The pickles have sat on my counter for 5 days, the spices are settled on the bottom of the jar and the dill or garlic powder looks a little “fuzzy” in the bottom of the jars. Today being day 5, I just placed them in the refrigerator but I’m wondering if I should give it more than 5 days on the counter to see bubbles before I refrigerate them? I made two jars using whole cucumbers and one jar with spears. The whole ones fit kind of snug in the jar so I never had an issue with them wanting to float to the top but the spears did a little bit but are still covered with liquid. Did I do something to make a complete mess of this recipe? Help! Thanks so much! How long should I leave them out before refrigeration or can I just leave them out all together and for how long? Thank you oh so much for this recipe. 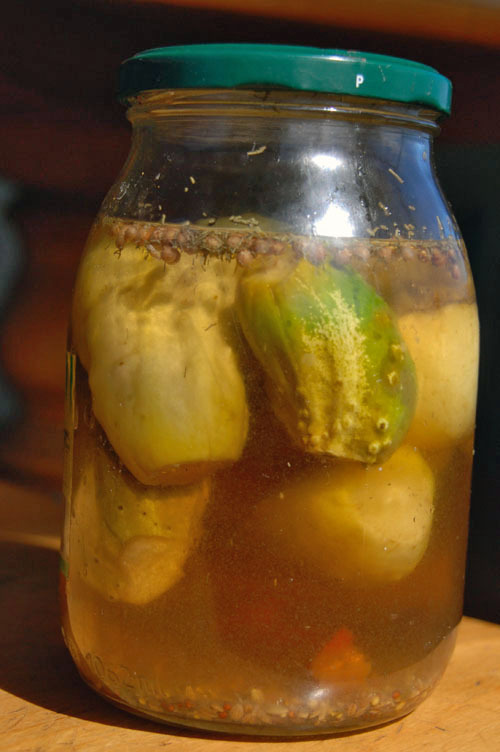 This was our first venture into fermented pickles, and I am so grateful for such a loose recipe (just the way I like ’em) that gives wonderful results. I just went from four jars on the counter (nearly done) to twelve, and there will be plenty more to come. Does the garlic need to be minced or chopped? Or does it just get thrown in whole? I’m excited to try this recipe. I have larger cucumbers so I plan to cut them in half…will that work? They are best stored in the fridge if you are not doing something to kill off the fermenting critters 0 they won’t go bag, but they might explode. If you had a closed vented crock like for sauerkraut, then the cold cellar would work. Cutting them in half is fine, and the garlic can be whole or chopped – if you use shopped, you can use less, or expect more garlic flavor faster. Put them in the fridge if they are getting too sour. They will continue to ferment. We don’t always get bubbles either, try one, if you like the taste then it is ready. The refrigerator slows down any ferment that might happen, and keeps them firmer over time.